Painting Mixed Media on Handmade Paper | 16" x 25.5"
Painting Mixed Media on Handmade Paper | 25.5" x 16"
Painting Egg Tempera on Handmade Paper | 18" x 18"
Painting Egg Tempera on Handmade Paper | 12" x 12"
Painting Egg Tempera Natural Pigment on Handmade Paper | 19.5" x 32"
Painting Egg Tempera Natural Pigment on Handmade Paper | 22.5" x 24.5"
Painting Egg Tempera on Handmade Paper | 27.5" x 27.5"
Painting Metal on Handmade Paper | 27" x 52"
Painting Egg Tempera on Handmade Paper | 52" x 27"
Painting Egg Tempera on Handmade Paper | 28" x 36"
I believe the essential function of art, in all its mediums, is twofold; it is a channel of expression and its manifestation takes on the dimension of creativity. Ultimately, it provides sustenance to the soul. In India, art stems from divinity; music, dance, poetry, sculpture and painting were an integral part of religion. Places of worship were the cradles that nurtured various art forms and imparted divinity to them, connecting the artist, the audience and the patron to spirituality and joy. Art, I feel, is essentially spiritual in nature and should aim at showing paths towards a higher plane of consciousness. The artist and the observer should both experience bliss and be enriched spiritually by its association. My inspiration for art continues to source itself from the wellspring of nature and the simple realities of the everyday world. Trees, birds, fish and lotus blooms - all are metaphors for depiction of the complexity of human endeavor against the simplicity of the existence of primal life forms. My journey of self - expression and self exploration winds its way to the gradual juxtaposition of the possibilities of human enlightenment through the balance of the self on the palette of nature. The expression of the human spirit, its freedom, the splendor of its existence and the celebration of its immortality are transferred onto my canvases. The ultimate truth, the tranquility and simplicity of the reality beyond the apparent is what I seek to convey in my work. Anjali Sapra’s tryst with art began many years ago. A keen interest in the visual arts from an early age led to a study of Indian art forms. The intricacies of Mughal miniatures, the earthy hues of Worli painting and the rich cultural heritage of India have all profoundly influenced her. 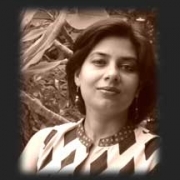 She worked at Triveni Kala Sangam from 2001- 2005, subsequently training under a senior artist. This association took her back to the roots and the earlier study of Indian art. The origins of natural pigments, the creation of colour, turning mundane substances into shimmering hues and using them on blank canvas, all led to an evolution in her thinking, making her work relate inspirationally to nature and the essence of being, expressing the spiritual struggle of humanity yearning to reach upwards into the light. Anjali Sapra works in layers, texturing the canvas as she imbues it with colour. There is extensive use of gold and silver foil as well as natural pigments, which are freshly made each time they are used. She has worked with a variety of media: using vegetable dyes and gouache on handmade paper, egg tempera, charcoal, pen, ink, oil and acrylic on canvas. Anjali Sapra has held group and solo shows in Mumbai New Delhi, Bangalore and London. Her work is in several private collections in India and in countries like the United Kingdom, Germany, Netherlands, USA, Canada, Hong Kong, Thailand, Australia and Singapore.